In the future, your garden might change colors every day. That’s if a Colorado-based company can meet its goal of designing a petunia that goes from pink to blue and back again with the sun’s rhythms. “All plants have circadian rhythms like people and animals where they kind of follow the sun,” Havens says. In the “Petunia Circadia,” the flower’s pigment molecules will be linked to this daily rhythm, causing it to change colors every 12 hours or so entirely on its own. This sounds like science fiction, but it’s not far off. Havens and Braun have already engineered a petunia that goes from white to red on command when given a sip of beer. Why beer? The color change is activated by ethanol, and alcohol is a good source of this stuff. “It’s an easy molecule to use and it’s pretty ubiquitous,” Havens says. “The whole point was to make something everyone can use.” These beer-drinking flowers are a gift for backers of the Indiegogo campaign. A contribution of $42 gets you a single plant; additional contributions get you more. They’ll arrive white and, once given a drop of beer, turn red over 24 hours and remain that color for about a week, or until watered again with regular H2O. The catch? Shipping isn’t set to start until the spring of 2017. These shade-shifting flowers are a poster-child for a larger mission: raising awareness about genetic engineering, and removing some of the stigma that comes with it. Genetically modified organisms (GMOs) are mired in controversy, which Havens says is hampering potentially valuable research. Case in point: She turned to Indiegogo for fundraising because no horticultural company wanted to be associated with the GMO drama. “There’s this unnecessary fear around GMOs,” she says. “There’s a lot of confusion about what the technology is and what it does and what it can do. 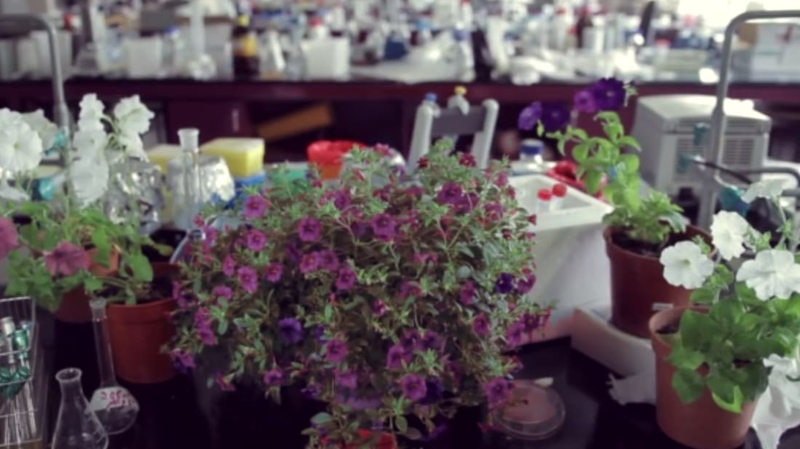 You can use it to do whatever you want, so we wanna make beautiful things with it.” She says biotechnology could someday be used to create new smells for flowers, or polka-dotted petals. Revolution Bioengineering is working with British artist and designer Helen Storey to create a dress that incorporates the color-changing flowers that will be on display in London next summer. “It will be a commentary, and start a discussion on how what society does impacts nature and how nature can come back and inform society,” Havens says. The campaign sits at around $18,400 and has a long way to go to reach its $75,000 goal by April 9.